The Irvine Church, National Forge Road, Irvine PA , is the oldest Church in Warren County. It has continuously served the locals for 179 years at this location and in the same building. It is on the registry of National Historic Places. 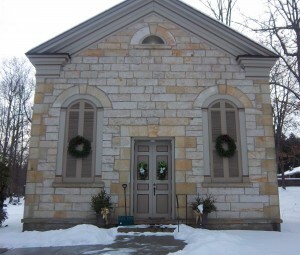 Dr. William Irvine built the stone structure as a wedding gift for his wife Sarah Duncan. Sarah was teaching Sunday School on their big porch for the children of their tenant farmers and local Indian children. She asked for a simple frame structure to use as a Church, but the Doctor had another vision. He hired an immigrant stone mason from Scotland to build the classic structure. Unfortunately, the first service in the Church was Sarah’s funeral, hence, the Church is known to the locals as the Church that Love built. Generations of members have practiced that love by serving the people of the area via sharing their Christian beleifs and provisions. Services are held every Sunday at 9 a.m. All are welcome. Current Projects/Needs: Five years ago, the Church had serious structural problems. An engineer and an historic restoration contractor were hired for to do $170,000 worth of repairs. The repairs where made and the structure was restored to its original beauty. Members and many friends made donations, however, the small congregation had to borrow money to complete the project. Members are still paying the loan. Donations via Warren gives would help pay for the restoration of this piece of history.